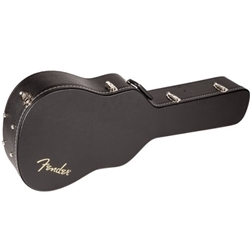 The Fender Flat-Top Dreadnought Acoustic Guitar Case is the ideal case for your dreadnought-style guitar. This case is not only designed with dreadnought-style contours so that it fits your guitar perfectly, but it is also made from durable, lightweight 1/4" plywood covered by a tough, textured vinyl. This case protects your prized dreadnought against the bumps and dings of loading in and out of the gig, plus it protects it while at home. It has a sleek, classic black exterior with black plush lining on the interior that hugs your guitar firmly yet gently while in transit.